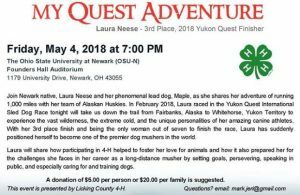 What is Ohio 4-H Dog Expo? Dog Expo is an opportunity for 4-H members (AND their dogs) to learn skills to help them be more successful with their 4-H dog projects. Teamwork between the 4-H member and their dog is emphasized throughout the sessions. Dog Expo is open to all 4-H dog project members and their dogs, whether this is their first year or they have been taking dogs for several years. Experienced 4-H dog volunteers and resource people will be present to help 4-H members. Dog project members are welcome to attend at no cost if they are not bringing a dog. Dog advisors are welcome to attend without dogs at no cost. When is Ohio 4-H Dog Expo? Dog Expo will be on Saturday, April 27 from 9:00am-2:30pm. Where will Ohio 4-H Dog Expo be held? Dog Expo will be held at the Clark County Fairgrounds, 4401 S. Charleston Pike, Springfield, OH 45505. There will be several buildings devoted to the different sessions. Registration will be in the Youth Building. What is the cost? 4-H’ers can come for half a day or all day. It will cost each 4-H’er $10.00 to participate for half a day, and $20.00 to participate for a full day’s worth of sessions with their dogs. You MUST pre-register. There are NO same-day registrations. We will NOT accept walk-ins. 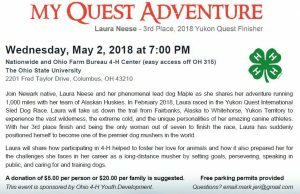 ONLY the 4-H member may bring their dog. Puppies under 6 months old are not allowed. Other dogs are not permitted on the grounds. Advisors can attend for free, as well as parents and siblings. 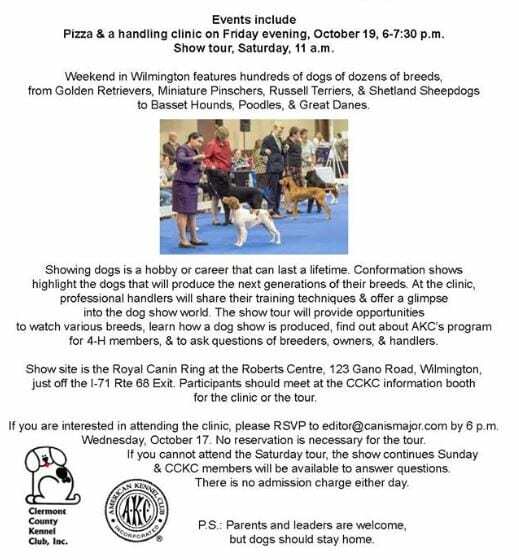 Advisors and 4-H members attending without dogs need not pre-register. When is Registration due? Registrations must be postmarked by Monday, April 15. You must send your money along with the registration form to the address at the bottom of the form. You can download the information and registration form at www.go.osu.edu/calendardogs by clicking on the link corresponding to the April 15 and April 27 dates. Who should I contact? For general questions, please contact either Lucinda Miller, Extension Specialist, 4-H, at miller.78@osu.edu, 614.292.7453, or Jennifer Newell, State 4-H Dog Advisory Committee at NewellFarmJenn@gmail.com. Registrations must be sent to Jennifer Newell (address on registration form) by the postmark deadline. The application for the 2019 Canine King/Queen and Puppy Prince/Princess is now available. Applications are due by Friday, June 7, 2019 to the address listed on the application. 2019 State 4-H Animal Sciences (Livestock, Companion, and Small Animals) Event Calendar is now available on the Ohio 4-H website. It will be updated as needed. Please pay attention to the “Last Update” date to ensure you have the most recently updated copy. 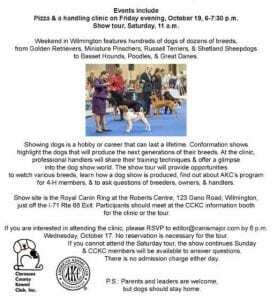 The Clermont County Kennel Club invites 4-H dog handlers to a handling clinic and behind the scenes show tour at their Weekend in Wilmington, October 19-20. See the flyer below for information. Please be aware of the following deadlines for 4-H members interested in showing livestock or dogs at the Ohio State Fair. 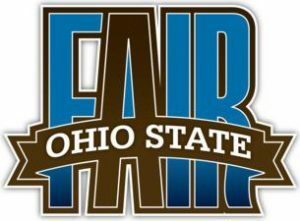 You must be enrolled in the project you are entering at the Ohio State Fair within the Licking County 4-H program in order to be eligible to show at the state level. Wednesday, June 20 – Rules can be found at and entries can be made at https://ohiostatefair.com/livestock/ . Volunteers (18 years old and not in 4-H or FFA) for the skillathons are responsible for facilitating a station. A station requires youth to perform a series of tasks to test their knowledge about a subject related to the species. Facilitators are not required to have broad experience or knowledge about the species. If you agree to volunteer, we will send a follow-up letter in July with parking and admission passes, as well as additional facilitator information. CHANGES IN 2018 OHIO STATE FAIR JUNIOR FAIR DOG SHOW FOR AKC TRICK DOG AND AKC CANINE GOOD CITIZEN RULEBOOK! As of June 1, 2018 AKC has changed the requirements to receive an ADVANCED TRICK DOG TITLE from a total of 5 tricks to performing a total of 10 tricks. Therefore, since we follow the AKC Trick Dog rules as 4-H members can earn Trick Dog titles when entered in the Advanced Trick Dog class, we have updated our rules and Tricks Checklist: Advanced, to reflect the changes AKC has made. Also, an updated Trick Dog Evaluator Guide will be posted once AKC has theirs updated and posted. Advanced Trick Dog is the only change in this rule book. Please be aware of this change if entering the Advanced Trick Dog class. Dogs must have their Novice and Intermediate Trick Dog titles before entering the Advanced Trick Dog class. The rule book and Tricks Checklist has been updated and reposted at www.go.osu.edu/dog on the Resources page and the State Fair page. Ever wonder what it is like to race sled dogs or to spend weeks out in negative temperatures in the Alaska wilderness? Come see Licking County’s own Laura Neese speak about her experiences racing dogs in the Yukon Quest and Iditarod races. There are two opportunities for you to see her speak before she heads back up north to prepare for next year’s races. The Licking County 4-H Canine King/Queen and Puppy Prince/Princess Contest is open to Licking County 4-H members who are currently enrolled in a dog project. Applications are due Friday, June 8th. The contest will be held on Tuesday, June 19th at 7:00 p.m. at the Licking County OSU Extension Office.